Premium Seats for Opening Day – New England Patriots! Be a part of history as the Pats raise their Super Bowl Flag prior to Game 1 of the regular season. 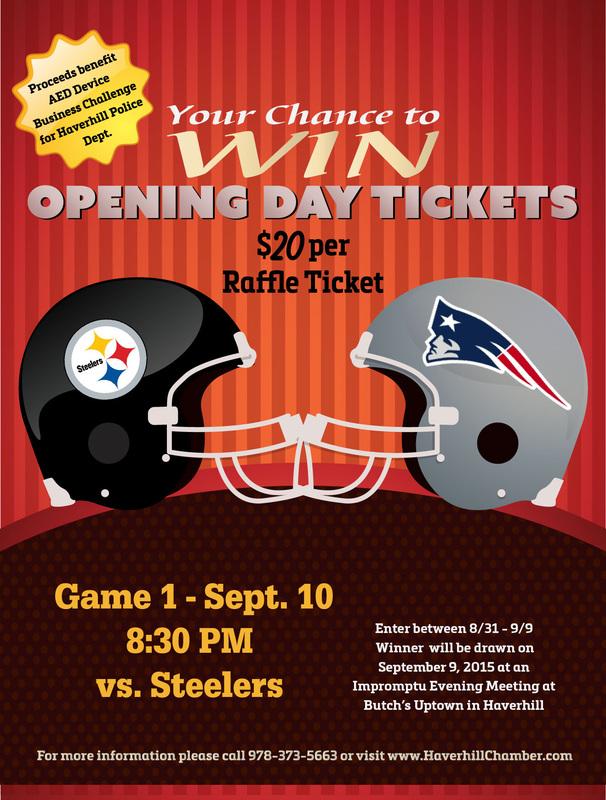 The business community is invited to take their chance at winning Premium Club Seats for two to the New England Patriots Season Opener against the Pittsburgh Steelers on Thursday, September 10th in Foxboro. 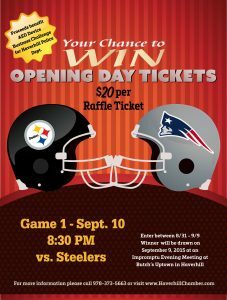 This raffle will benefit the Haverhill Police Department. The Haverhill Police Department is in the process of outfitting their police cruisers with Automatic External Defibrillators (AEDs) to better serve the local community. The Greater Haverhill Chamber of Commerce is assisting in the initiative to raise necessary funds in support of this effort. As such we have created this community-wide raffle that will be both a fun and engaging way to get to local business community involved. Tickets are available for a limited time and include $100 for parking. All tickets must be purchased online. Cost per ticket is $20 each. There is no limit to the number of tickets you may purchase. The winner will be drawn at an impromptu evening event at Butch’s Uptown at 5:30 PM. Don’t miss your chance for these PREMIUM SEATS! All questions may be directed to the Chamber office at 978-373-5663 or Info@haverhillchamber.com.